This summer we conducted a survey to find out more about our members – what is important to them, what their financial goals are, and how we can best serve them. One hundred and five individuals that comprise 6% of our membership base completed surveys. The information they offered will help us as we continue to provide tools to help you – our members – build a brighter financial future. The survey results demonstrated an increased uptake in use of financial tools by people of the Pine Ridge Reservation. The most popular financial tools being used by credit union members are the savings account and check cashing service. Thirty-one percent of people surveyed now have a savings account for the first time ever. In addition, about a third of credit union members are spending less money and time traveling to do their banking, and as a result are saving more. Having a financial institution close to home has also had an impact on the reservation economy. Nine percent of credit union members surveyed say they are now doing more shopping locally. 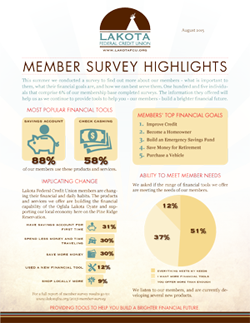 The Lakota Federal Credit Union Member Survey was developed, conducted, and analyzed by Lakota Funds as part of the Increased Customer Access Partnership Program, which was funded by the Citi Foundation. The Increased Customer Access Partnership Program is intended to leverage Lakota Funds’ relationship with the Lakota Federal Credit Union to increase delivery of development services and create greater opportunity for credit union members to access capital.